Over recent years the Buddleia plant has become a favourite amongst gardeners. In this guide, we take an in-depth look at Buddleia, or as it’s otherwise known, the Butterfly Bush. 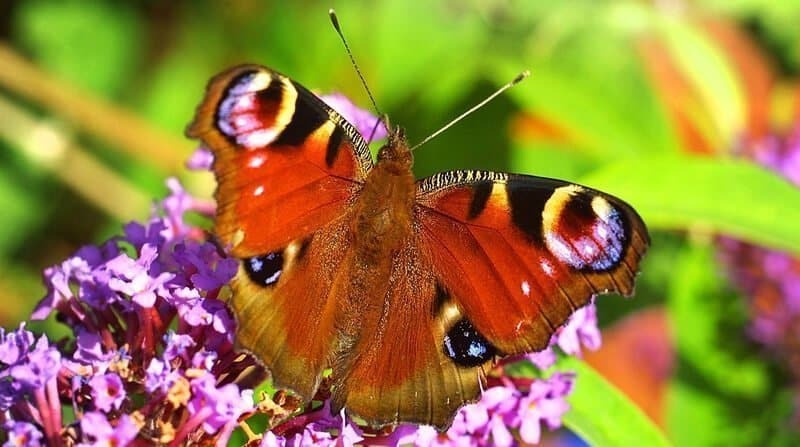 The Buddleia plant is commonly known as the ‘Butterfly Bush’ because of its ability to attract butterflies into your garden (as well as other beneficial pollinators). There are over 140 species of the plant but Buddleja davidii is the most common in gardens across the UK. Like many plants in the UK today, Buddleia is not native to the UK. It came from central and south-west China and was introduced into the UK as an ornamental plant in 1896. It was first recorded in the wild in 1922. Today, you’ll see them dominating railway landscapes and nearly any type of waste ground. The Buddleia tree is a hardy, medium to large perennial shrub with long, arching woody branches. It has lance-shaped leaves which are a deep, green colour. It produces flowers on cone-shaped heads, usually in August. These flowers smell like honey and contain a lot of nectar which attracts 22 different species of Butterfly. This is why Buddleia is affectionately known as the Butterfly Bush. Depending on the species, the size of the plant and the colour of the flowers differ. Buddleias grow in a variety of conditions. In the wild, you’ll see them in rocky areas, on wastelands and along railway lines where they get lots of sun. They don’t grow well in soils that retain a lot of moisture and prefer free draining slightly alkaline soils. You can buy Buddleia plants from most garden centres and even online. Suttons have been selling plants since 1806 and were awarded the Royal warrant in 1858 after supplying Queen Victoria seeds to the royal household. They have been one of the most trusted suppliers of plants and seeds ever since. Another one of my favourite Buddleia suppliers. Thompson & Morgan is another, well-trusted supplier of plants. I especially like their range of patio plants called ‘Buddleia Buzz’. They’re a compact version of the Buddleia plant designed for patios. 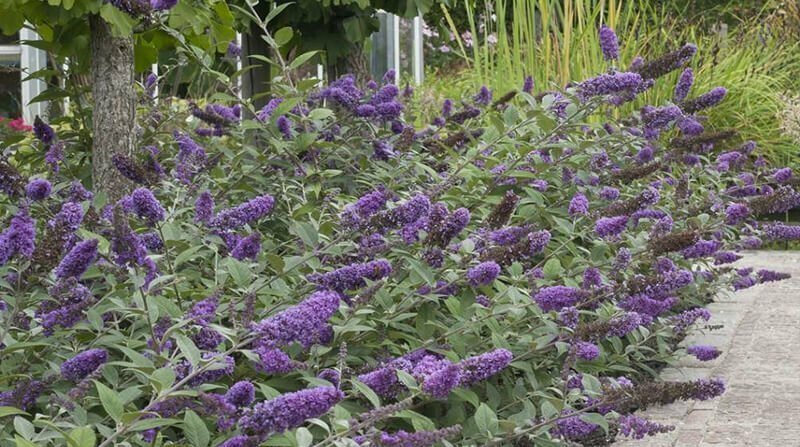 Planting Buddleia is easy but in order for it to grow and flower to its fullest potential, you must understand where, when and how to plant it. Wait until daytime temperatures are at least 10 degrees Celsius and nighttime temperatures are no lower than zero. Late spring is the best time for planting as the soil will have started to warm up. If you’ve got a fairly mature plant that you want to transfer to a garden border, it can be left as late as August. Like I said earlier, Buddleias grow best in areas that get lots of sun. You’ll see them on rocky wastelands and along railway lines. They grow well in most soil types as long as they’re free-draining, although they do prefer average to fertile soils that have a slightly alkaline pH. They don’t fair well in soils that retain water. Consider this when choosing a spot in your garden for planting. Make sure the area gets lots of sun and consider adding some lime to your soil if it’s on the acidic side. Planting Buddleia is simple enough. Depending on your garden and personal preferences, you can either plant them directly into your borders or in a pot of some description. If you’re planting several shrubs, make sure you space them between 5ft-10ft apart, depending on the variety. Loosen the soil, mix in some general purpose compost and dig a hole, twice the diameter of the plant’s container (I really like Canna Terra Professional Soil Mix). When placing the plant in the hole, make sure the top of the root ball is level with the surface of the soil. If it’s higher, the soil can dry out. If it’s lower the area could puddle. Backfill the hole with the soil you dug out. After planting, keep the shrubs well watered to settle the soil until they’re established. Around 1-1.5 inches a week is all they need. If there is rain forecast, you’ll not need to water. Choose a pot with adequate drainage holes. Add a couple of inches of pebbles to the bottom of the pot to help with drainage and air supply to the roots. Add plenty of good quality, free draining potting soil, leaving space to place your plant (Again, I love Canna Terra Professional Soil Mix). Place the plant into the pot and fill the pot up with potting soil, keeping the top of the root ball level with the surface of potting soil. Keep the pot well watered to settle the soil until the plant is established. Around 1-1.5 inches a week. Buddleias grow very quickly and flower incredibly well. This means that if you don’t take care of them they can have a tendency to grow out of hand. Not only that but they can also inhabit parts of your garden that you don’t want them to. Pruning a Buddleia bush will stop it from becoming untidy and encourage it to flower beautifully while preventing it from dropping seeds and spreading. It’s just as important to know when to prune Buddleia as how to do it. I’d say it’s even more important because pruning Buddleia at the wrong time of year could kill it. When it comes to deadheading, do this whenever you see a faded flower. 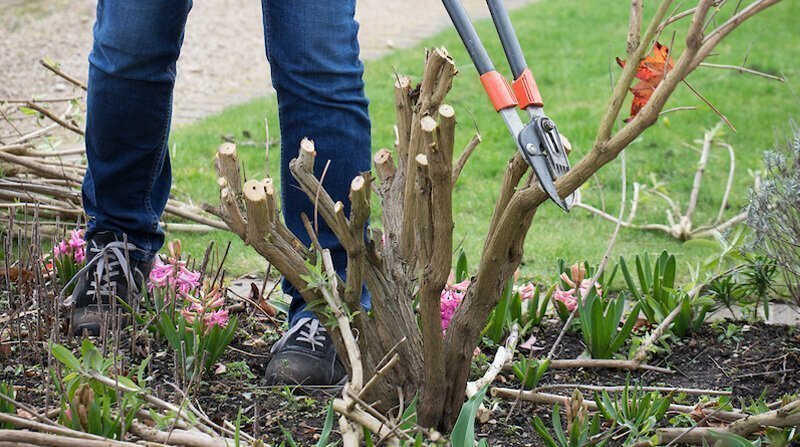 For hard pruning, do this in the spring when the harshest weather is over. Depending on how the weather behaves, spring could be March, it could be April. If you see new shoots developing don’t worry. You can still remove the old growth without negatively affecting the new. There are two elements to pruning the Butterfly Bush. It not only removes the flowers that have died off and turned brown, which keeps the rest of the plant looking healthy, but it also encourages new flowers to grow. 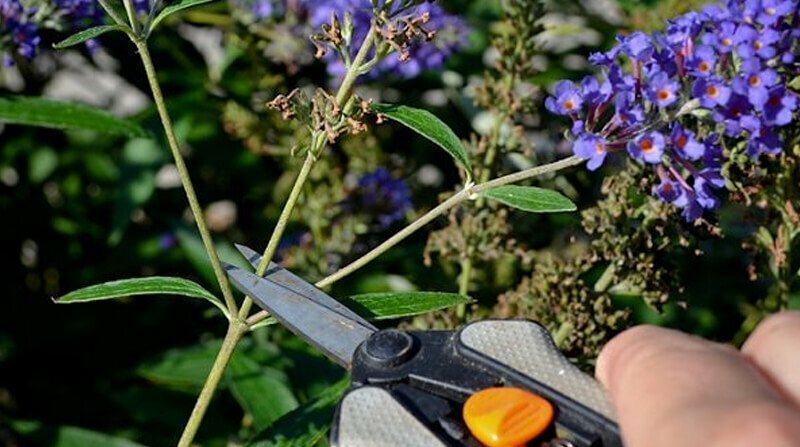 Simply remove the faded flower heads whenever you see them by cutting them back to the next leaf or stem joint with a pair of secateurs as seen in the picture above. To encourage new growth through summer, you should cut back hard in spring. Start pruning as soon as you see growth in early spring. Take a pair of secateurs and cut away the top growth so you can better see the base of the plant. Next, cut through the thick wooden stems. If you want to keep your Butterfly Bush relatively small, cut the woody stems right down to around 30cm tall. If you want it to grow tall, cut it down to around 60cm. Where possible, try to cut back to a bud or growing shoot. If there are any dead stubs or old, thick branches, cut them back so they’re flush with the main trunk. This will reduce the chances of dieback. It’s easy to think that you’re being too brutal and hacking away too much of the plant but Buddleia is an incredibly hardy shrub and it will re-grow very quickly. Cut the bush right back so you only have a stump with 5-6 main branches and seen above. 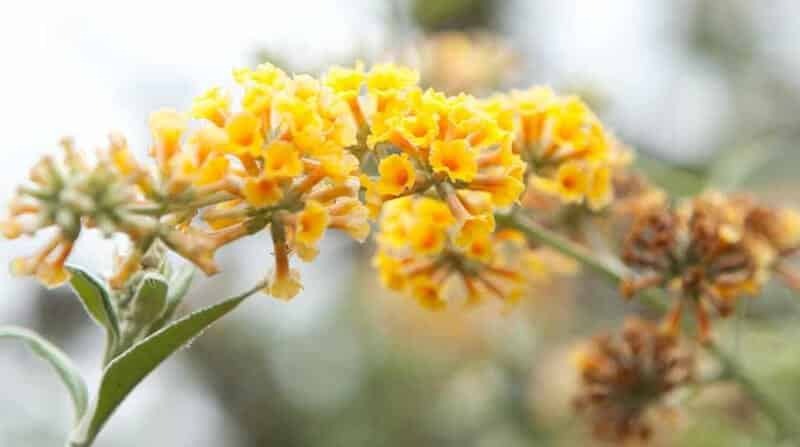 Butterfly Bushes are easy to cultivate. In doing so you’ll have brand new, flowering shrubs in as little as a year. Take softwood Buddleia cuttings in late spring, this will give the stems time to harden slightly. Fill them with a 50/50 mix of potting compost and horticultural grit. Compost on its own will hold too much moisture and you could find the stems of your new cuttings start to rot. Horticultural grit will help keep the soil free draining. Make several holes in the soil around the edges to insert your Buddleia cuttings into. That’s the pots prepared. Now it’s time to take cuttings. Take cuttings from the current year’s growth, ideally from a non-flowering stem. If you want to take several cuttings and most of the stems have produced buds or even flowers, cut them off. If you don’t remove the buds and flowers, the cuttings will focus all their energy into blooming instead of growing new roots. Your Buddleia cuttings should be a decent length, around 15cm. Cut just below a leaf node and then remove the lower leaves from the stem. Dip the stems into a pot of rooting powder and knock off the excess (I like Clonex Rooting Hormone). Then, put them into your prepared pots, insert them into the holes you made in the soil so the top leaves are level with the soil surface and firm them into place. Water the soil and cover your cuttings with a polythene bag secured to the pot with an elastic band to keep the leaves damp. Keep your cuttings in a warm place, in your greenhouse or your conservatory so the humidity in the bag stays fairly high. Check them periodically to make sure the soil is moist and give the leaves a spray. Rooting should take 2-4 weeks, depending on the conditions. A good sign of rooting is the shoots starting to grow but don’t rely on this entirely. The best way to tell is by giving your cuttings a gentle tug. If they stay firmly in place you’ve got good root development. Also, check the drainage holes for signs of roots. If in doubt, leave them a little longer. Once your cuttings have taken root, it’s time to put them in their own individual pots. Empty your pot of cuttings are CAREFULLY tease the roots of each cutting away from each other. Try to keep as much compost around the roots as you can. Pot them in their own pots and water them immediately. These new plants are fragile so you don’t want to put any undue stress on them. Keep them under cover and avoid putting them in draughty areas or in direct sunlight. Keep them watered until they’re well established. If you took your Buddleia cuttings in spring you should have a fairly well-established plant by the following spring. In which case it’s time to plant them outside, either in a flower bed or in a patio pot. However, don’t just rush out and plant it. Place your new Butterfly Bush outside in a shaded, well-sheltered for a week or 10 days to give it time to acclimatise to being outdoors. Once it’s acclimatised, plant it in a sunny area in well-draining soil. The Buddleia Bush is a hardy plant and shouldn’t give you many problems at all. However, on rare occasions, it can fall victim to pests and disease. Spider mites have a tendency to attack stressed bushes and shrubs during dry periods. They can be hard to see but if you hold your hand or a sheet of paper under a branch and give it a shake, you’ll see the tiny red/orange fall off. The best way to avoid an infestation is proper care, especially in hot, dry weather. Keep the plant watered and deadhead regularly to remove spent flowers. If you do find yourself with an infestation, you could try to control them by spraying your butterfly tree with pressured water or by introducing predatory bugs like ladybirds. 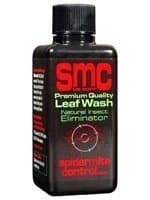 However, the quickest and most effective solution is to spray the plant with an excellent product called SMC Spider Mite Control. It’s completely safe for humans and plants but works by suffocating the spider mites by coating them in an ultra-thin oil. Simply mix the solution with water as per the instructions and spray your Butterfly Tree. Within a few days, you should the infestation has gone, or at least greatly reduced. In which case, apply a second treatment to get rid of the remaining mites. In some areas of the garden, nematodes are a good thing. Around your Buddleia tree, not so much! Nematodes are tiny, microscopic worms that live in the soil and feed on the roots of the plant. Unfortunately, they’re difficult to eradicate. That said, they thrive in well-watered soils and Buddleia doesn’t need that much water. So limiting the amount of water will reduce the activity of nematodes and keep your plant healthy. This disease occurs in cool, damp conditions. If your Buddleia bush stays damp and doesn’t have the chance to dry, you might notice furry patches develop on the underside of the leaves. The tops of the leaves will turn yellow before going brown. Fortunately, fixing it is easy by cutting away the affected stems. It’s also easy to prevent in the first place by planting your Butterfly Trees in areas of the garden that get plenty of sunlight and proper air circulation. Also, give plants in borders and beds enough room for air to circulate between them. If they start to grow into each other, prune them back. Also, water plants at the base instead of over leaves. There are two root diseases that can affect your Buddleias. They are Rhizoctonia and Phytophthora. The leaves of infected Buddleias often turn yellow and if you do a little digging you might see the plant has rotting roots. This makes impossible for them to take in the nutrients the plant needs. As a result, the plant lacks in nutrients and the leaves start to turn yellow. The flowers won’t bloom very big or bright either. These diseases will only really attack plants that are planted in wet soils that hold onto moisture. If you followed my earlier advice on where to plant Buddleia, you should never experience this problem. However, if your Buddleia is suffering from root rot, the best thing to do would be to remove it, improve the drainage in the soil in that area and plant a new shrub. Buddleia is a fast-growing, hardy shrub. There are over 140 species that produce beautiful flowers which smell of nectar and attracts several different species of butterfly to your garden. It’s also an easy plant to look after with regular deadheading and annual hard pruning. However, you MUST look after them because if you don’t, they can self-seed and take over your garden. 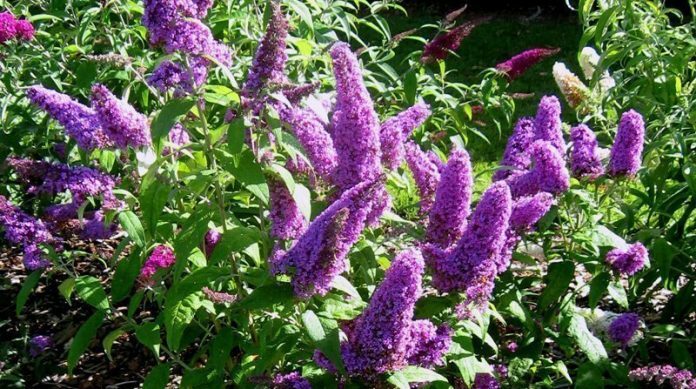 Personally, I love Butterfly Bushes but what about you? Do you have them in your garden? Are you thinking of planting them? Do you have any questions or something you’d like to say?